We are a members club but you will be most welcome as a visitor. If you enjoy your evening and want to come back then we hope you will want to become a member. We have the main function room which has a large dance floor and a small stage at the Royal Naval Association which is in East Street, Southend half way between Victoria Avenue and Prittlewell Station. There is a bar at the RNA and there is a car park with an entrance through the driveway to the right of the club building. Doors are open at 8.00 and dancing starts at around 8.15pm. We close at about 10.30. The entrance to the RNA is sometimes locked but there is an intercom to the left of the door and a button to press. This is not a club for children but members are welcome to bring children occasionally if they are aged 11 or over. Children are allowed in the club room but not in the bar. The address of the RNA is 73-79 East Street, Prittlewell, Southend-on-Sea. For those with Sat Nav the postcode for the RNA is SS2 6LQ. We are close to buses along Victoria Avenue and the nearest bus stop is The Blue Boar. 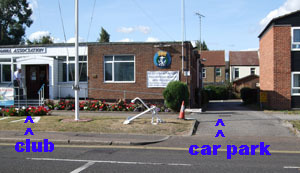 The car park is rather small but street parking is available nearby. If you want any more information please phone 01702 553622 or us.